"It's a jet trike," says Rich Hanner, Philly area resident and creator of Project Frisbee. 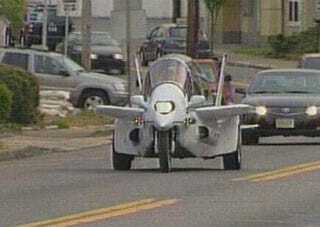 The car-bike-plane mashup is modeled after a F-14 Tomcat and sports a wingspan adjustable up to 15 feet, though we imagine show off is limited to the car-bike-plane events Mr. Hanner attends. Powered by what we assume is an Acura Integra mill mounted in the rear, the jet trike also has a powered canopy, air conditioning, and tandem seating. The creation took about a year to build and as you might expect, draws its share of gawkers, not the least of which was "Dream Weaver", the professional journalist who covered the story over at NBC10, where you can find the full story and video.